At the start of each round, an objective card is drawn which sets several things: the total resource value, the capacity, and its objective value (plus, some have special rules for the round too). 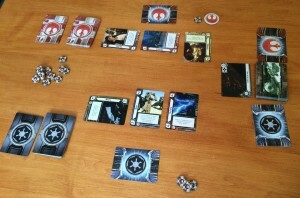 Each round, players take turns drawing or manipulating resource cards from their own resource deck (Empire or Rebellion). Each resource card has a number on it (usually 2 to 5) as well as a special power, and players can never have more resource cards than the objective’s capacity. The round ends only when both players pass in succession, and which player won the round is assessed. Usually, the player with the cards whose total value is closest to the the objective’s total resource value (without going over) is the winner of the round – there are some occasions when this is different but I’ll explain that later. The winner takes the objective card (as well as any resource tokens it grants) and the first player to have objective cards whose total objective value is 7 or more wins the game. So far, it sounds simple, but this game is more than just a push-your-luck game of card drawing due to two important game mechanics. The first to look at is manipulating cards. On their turn a player can either: (a) draw 1 of their resource cards and add it to their cards – which are always displayed on the table, (b) use the power of one of their non-exhausted resource cards, (c) spend an influence token, or (d) pass. Each resource card has one of 4 powers: discard 1 of your cards, discard 1 your opponent’s cards, exhaust 1 card (your’s or opponent’s), or look at the top 2 cards of a deck and discard one (your’s or opponent’s deck). So, using a card for its power allows you to alter your, or your opponent’s, cards which can affect your/their total resource value and/or which powers are available to a player. When a card’s power is used, it is exhausted (turned sideways) but a player can use their turn to spend an influence token to ready an exhausted card (turn it upright) so it could be potentially used again on a future turn. Whilst you can never have more cards than the current objective’s capacity, your total resource value can be greater than the objective’s. The second important game mechanic are the strategy cards. At the start of each round (after seeing the round’s objective card), each player selects one of their 5 strategy cards which remains secret until the end of the round and these introduce some interesting mind games. Some strategies are simple such as one lets you choose your opponent’s strategy card for the next round, and one gives you 2 influence tokens if you lose the round. However, one says that (so long as both players haven’t exceeded the total resource value) the player with the lowest total resource value wins the round – this adds a very interesting mind game as you’re often not sure if your opponent is trying to ‘lose’ the round. One other strategy automatically adds 2 to the player’s total resource value (not optional) so, again, your opponent may be playing to score just less than you on purpose (but then maybe you have the same strategy card too). After a round, each player’s used strategy card is discarded and all 5 must be used before they get them all back again. The last thing to mention are the character resource cards which are special resource cards (like Luke Skywalker, Boba Fett, etc.) whose resource value is 6 when ready and 1 when exhausted, plus each has a unique power too. Players start the game with 4 (out of 8) character resource cards in their decks and more can be added (and/or some removed) during the game. 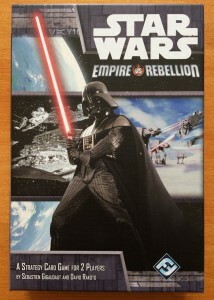 Star Wars: Empire vs Rebellion is a fast-paced game of card manipulation to bend the situation to your advantage. With just one action per turn, turns are simple and short, plus the action you perform can be very important. Using card powers to manipulate the situation to your advantage is interesting as the situation can change rapidly – it’s always satisfying when you find a way to change a bad position into a good one – and the advantage can flip back and forth as players keep altering the balance. The timing of using card powers can also be crucial too, as can using your powers to alter your opponent’s cards and total, as well as using a character resource’s power to drop its value from 6 to its exhausted value of 1. A round isn’t necessarily lost if you’ve gone over the total resource value but not the capacity as you can draw further cards to try and get ones with powers that are useful, i.e. to discard high value cards. However, ending a round with a higher total than the total resource value means your strategy card is ignored and I like that this adds a decision of whether to stop with a lower total but get the use of our strategy card, or whether to go for it and keep drawing cards to try and rescue the situation but jeopardising your strategy card’s effect. There is some luck of the draw in the game which is felt more when the capacity for the round is low (total resource value too to a lesser extent) as there’s less room for manoeuvre; however, luck of the draw is acceptable in lighter, shorter games (and you could minimise this effect with a house rule to remove objective cards with low capacity). The Star Wars theme is applied to create the two sides although, overall, it’s an abstract game with a theme applied to it, but this is fine because it’s a good abstract game. Players that don’t like basic mental arithmetic may not like this game as it requires constant (although very simple) addition – adding up the totals is straightforwards, but quickly assessing the affect of readying/exhausting/discarding cards on the totals is important and constant. Even if your mental arithmetic is great, it helps the game flow if each player calls out their current total after their turn (rather than require both players to keep track of both of their current totals). However, I can see that this game could actually be a fun way to improve these sorts of skills. 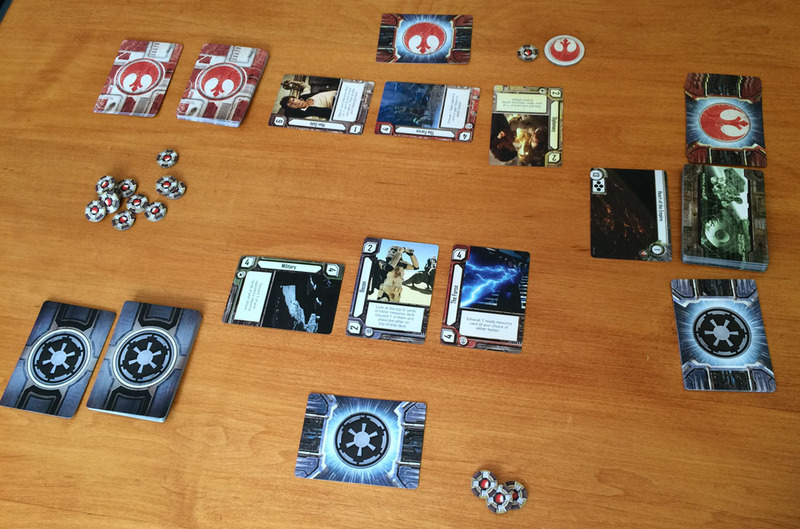 Overall, Star Wars: Empire vs Rebellion is a light, fast and fun card manipulation game which can have some great moments of tension and humour, especially when revealing strategy cards, and drawing vital resource cards. However, if you’re a gamer, you may prefer the game that Star Wars: Empire vs Rebellion is based on instead – Cold War: CIA v KGB – as it has a bit more gameplay to it (see my comments below comparing the two games). Star Wars: Empire vs Rebellion is a slightly simpler version of Cold War: CIA v KGB. The main differences are having one deck per player (rather than one single deck), the additions of the influence tokens (allowing you to ready an exhausted card), playing through all the strategy cards before re-using any of them (rather than all being available each round except the previously played one), and not being able to steal another player’s card (probably due to each player having their own resource deck rather than one deck between both players so Emperor can’t join the Rebellion). The character resource cards with values dropping from 6 to 1 in Star Wars: Empire vs Rebellion are nice, and I like the special rules on some objective cards (such as certain powers can’t be used during a round) as these add more variety to the rounds. There aren’t any objectives with 1 card capacity which is good as these were always a bit too random. Also, Star Wars: Empire vs Rebellion is usually shorter than Cold War: CIA v KGB (which I find is often a bit too long, but that’s solved by playing to slightly fewer total points). However, there are some areas which I think are better in Cold War: CIA v KGB. One example is the role cards as players can choose any card (apart from the last one used) which means the use of the ‘win with the lowest total’ could be in play more often (rather than definitely being out of the game for x rounds until all other cards have been played) and this increases the tension and psychological play more. Also, the assassin role which could kill off an opponent’s role (strategy) card is not in Star Wars: Empire vs Rebellion which is a great shame as that adds some extra tension to the game too. Having one combined deck in Cold War: CIA v KGB means the power ‘steal a card from the opponent’ was in the game and this adds some extra tactics and options (especially as you can gain a card of known value and/or power). Plus, I think the power to look at cards in the deck is better in Cold War: CIA v KGB because it affects the single resource deck and adds more psychological play as a result – the reason for this is that, if you place a card back on top of the deck, your opponent has to decide if you’ve placed it because (a) you want them to draw it (so it will adversely affect them), or (b) you’ve placed it expecting them not too take it so you can take it yourself, or (c) neither of the above but at least it’s screwing with their mind. Both games are good games and I think Star Wars: Empire vs Rebellion is a lighter game which matches a lighter target market (and I can see this fits well when selling a licensed game with such wide appeal on a large scale). As a gamer, I prefer Cold War: CIA v KGB because the small, but important, differences makes it a bit more deadly, there’s a bit more scope for tactics and psychological play, plus I felt I had more options when manipulating cards in Cold War. As the games are so similar, you’re unlikely to need to have both in your collection; however, I recommend having at least one of them. This entry was posted on Wednesday, May 6th, 2015 at 3:44 pm	and is filed under Board Game Review, Board Games, Star Wars: Empire vs Rebellion. You can follow any responses to this entry through the RSS 2.0 feed. You can leave a response, or trackback from your own site.